I don’t know about you, but there is just something I absolutely LOVE about getting cards and letters in the mail. In today’s fast paced world where you can talk to someone miles away instantly via social media, text message, or even email, we really take communication for granted. I love the Christmas season because my mailbox is always full of cards! Even if it is just a quick store bought card, a homemade version, or maybe a photo card, I love getting that personal little message from someone I don’t see on a regular basis. As much as I love being the recipient of said cards, I also really enjoy sending them. It’s an opportunity to update friends and family we don’t see or talk to often enough, on what has been going on in the past year. 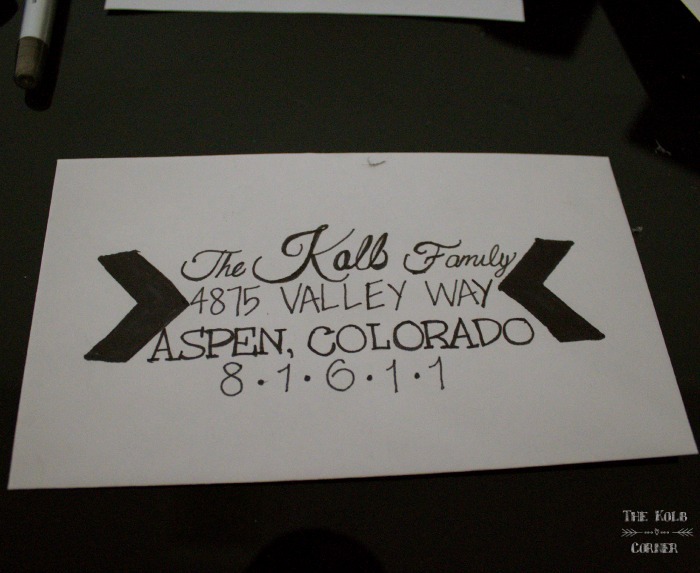 It’s also a time where I can get totally creative on how I address the envelope. Yep, that’s right. For me, it’s not just about sending the card, or letter. It’s the perfect opportunity for me to sharpen up my handwriting skills. 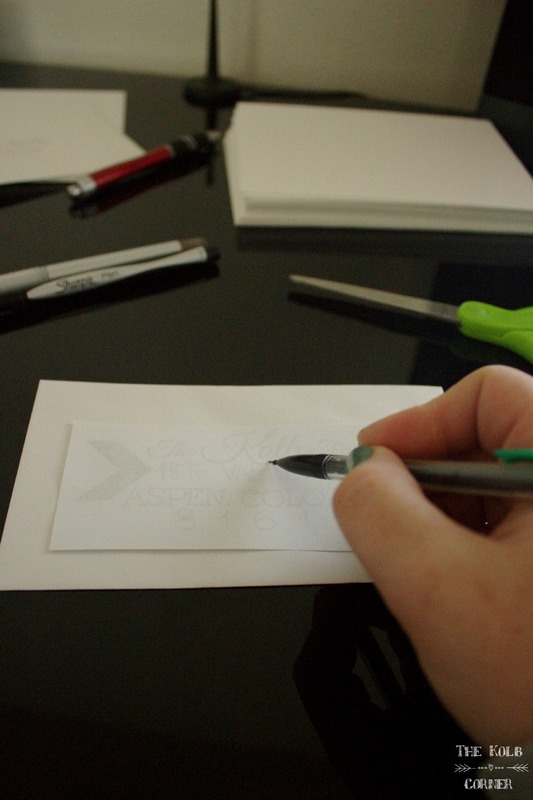 I’m sure if you’ve been looking for ways to address envelopes, you’ve stumbled upon many etsy shops that offer their caligraphy skills to hand address them for you. I know that’s what I always came across anyway. 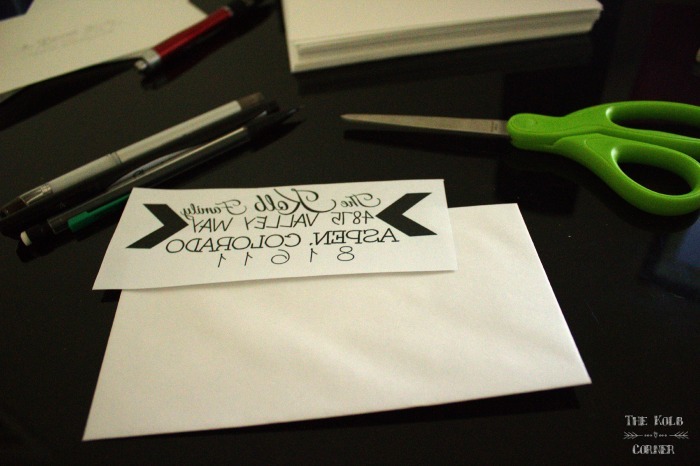 Well, today I’m going to show you how to address envelopes by hand, using PicMonkey. Yes, it does take a little bit more time and effort on your part, but the end result is a beautiful, professional looking, hand addressed envelope. 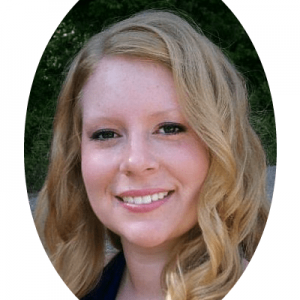 So first, let me tell you a little bit about PicMonkey. It is a FREE photo editing, and designing program that you don’t have to download! 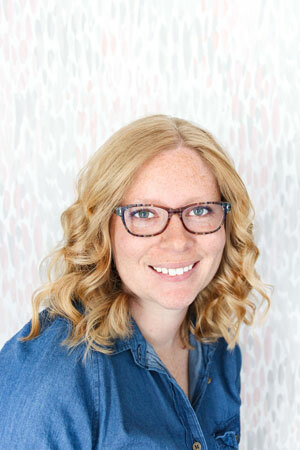 If you’ve never used PicMonkey before, be sure to check it out. Right now for the holidays, they are even offering a FREE 30 day trial of their Royale membership. This gives you access to all of their fonts, graphics, and effects! 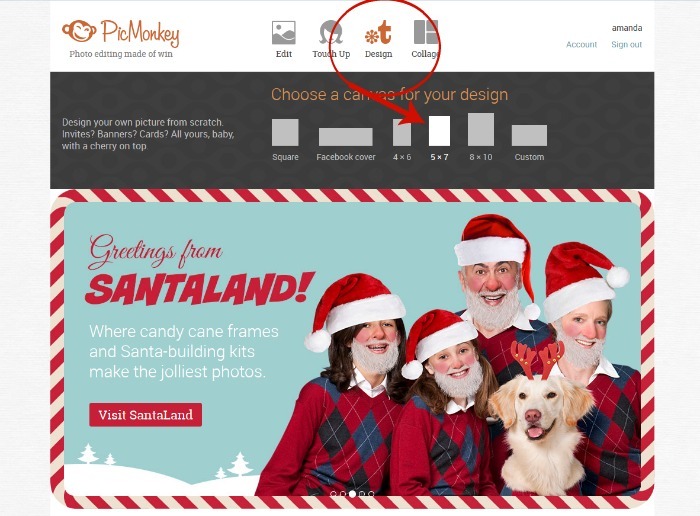 Updated 10/20/2017–PicMonkey is no longer a free service, and to save, share or export your designs you do need a subscription. The good news though, is that there is no longer “premium” graphics or fonts. If you have a subscription whether monthly or annual, you have access to all of their fonts and graphics. It is still very affordable at under $50 per year if you go for the annual subscription. They are also offering a free 7 day trial for you to try it out to see if you like it. Even though they have changed the subscriptions, PicMonkey is still a design and editing software I recommend to beginners. It’s a very user friendly and easy to navigate software! 1. First things first, you will want to create a blank picture by hovering over the “design” icon, and clicking on your desired size. You will want to choose 5×7 (or 8×10), to make it easier when you transfer the picture to a text document. For my examples I used the square option. 2. 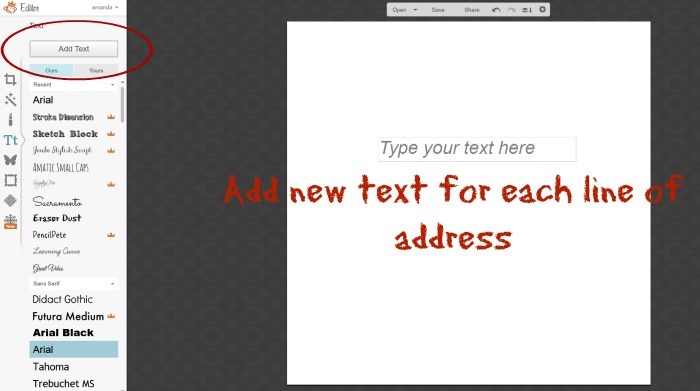 Next, type out the addresses, making each line a separate line of text rather than just hitting enter. 3. 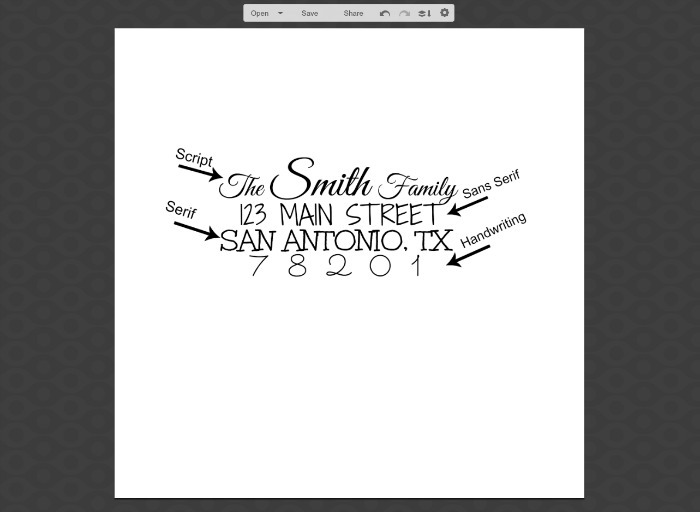 Now for the fun part–picking which fonts to use! With the free Royale trial, there are so many different fonts to choose from! Some things to keep in mind when choosing which fonts pair well together are to think of the actual “type” of font. Knowing the difference between serif, sans serif, script, and handwritten makes all the difference. In my examples I used one of each type. 4. 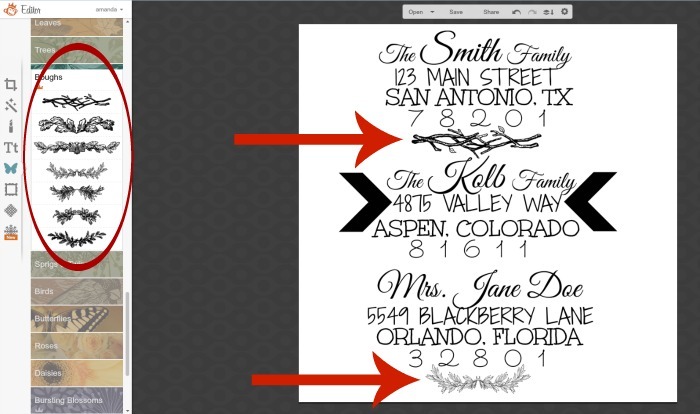 Once you have the perfect fonts picked out, type out more addresses until you’ve filled up the page. Depending on how big the font is, you should be able to fit quite a few. If you really want your envelopes to stand out, you can even add some graphics–like bold arrows–or something more in tune with the season like a bough or wreath. 5. Once all of the addresses are typed out and saved to your computer as JPEG’s (you will probably have more than one), it’s time to put them in a text document. I’m sure most of you have Microsoft Office Word, but I will be using a similar word processor called. Libre Office. All you have to do is select insert>picture, and find your saved JPEG’s. 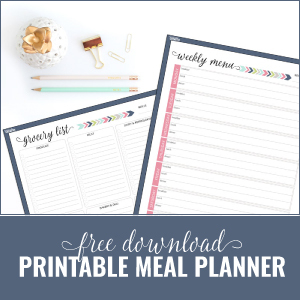 This is where choosing that 5×7 (or 8×10) template would come in really handy! 6. Once the pictures are lined up and positioned the way you want them, flip the images horizontally to make the images look mirrored. I’ll show you why in a minute. 7. Next print out the document, cut each address out and set aside. To transfer the addresses to the envelopes you will need a pencil and a pen. I prefer using the Sharpie pens because of how smoothly they write. Plus when you are sending cards, the envelops are thick enough you don’t have to worry about bleed through. …then shade all over the back of the paper with the pencil. 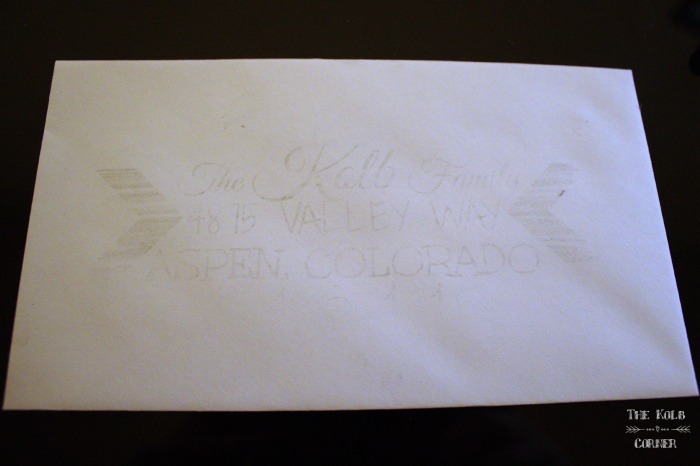 Make sure to apply some pressure because you are transferring the ink from the other side to your envelope. Now do you see why we needed a mirrored image? 9. Now remove the paper from the envelope. You should be able to see the transferred writing clearly. 10. 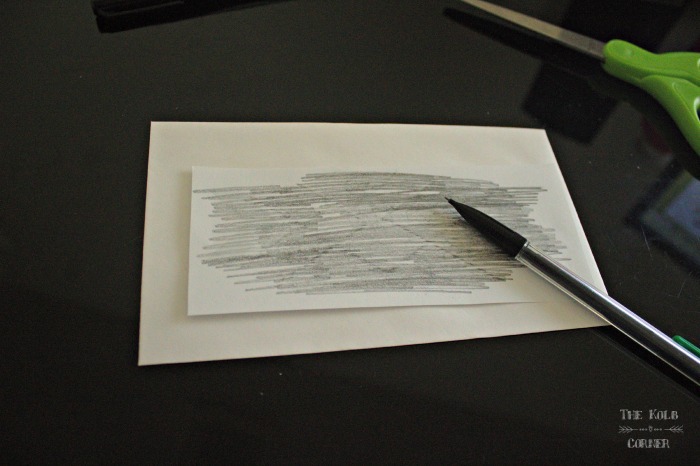 Trace over the writing with a sharpie or pen. I used a regular sharpie on the arrows, and they did not turn out as crisp. It doesn’t have to be perfect because after all, it is handwritten! I really love the look it gives to the Christmas cards. Just an extra touch to make them stand out. So what do you guys think? Love it, or not worth the time? Do you like sending and receiving cards? Leave me a comment below with your thoughts, I’d love to hear from you. 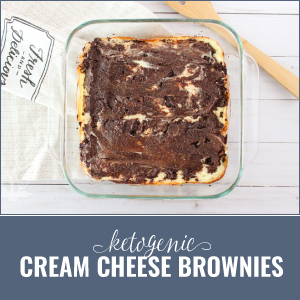 I would’ve never dreamed you could do this! I think it would be great to do if you only had a few cards to do, but I can’t imagine trying this if I had to send out more than 25! Great idea, Amanda!! I had about 20 this year 🙂 I had to take several breaks to rest my hand lol. But in the end it was TOTALLY worth the effort. This is really neat! The fonts are nice and very easy to see! Popping over from Teach Me Tuesday =) I love Pic monkey! I never thought of transferring text! Thanks for the idea. 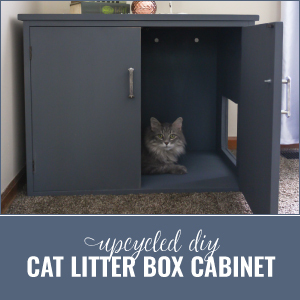 Be sure to share your crafts & DIYs at Two Uses Tuesday over at Sarah Celebrates if you don’t already! Thank you for stopping by Sarah! Coming to link up now! You make this look so simple! thanks for sharing. I love that you are encouraging the sending of Christmas cards (or snail mail any time of year) as there is just something so wonderful about opening up the mail box to find a card or a letter! Right?! I love getting snail mail–it makes you feel closer to the sender than receiving a text or email, I think. i love it. I don’t know if I’d want to do it on a 100 cards but maybe after I did a dozen, I could freehand the rest. After a few you start to get the hang of it and it goes really fast! This would be a great idea if I only needed 10 or so, but I couldn’t imagine doing 100 of these – my hand might fall off. LOL I’m so glad you showed us how to do this. It will be perfect when I need to send a few thank-you cards. Yes it does get old after a few, but it’s not terrible! For Christmas I did around 25! It’s perfect for just a few. Thank you for stopping by! 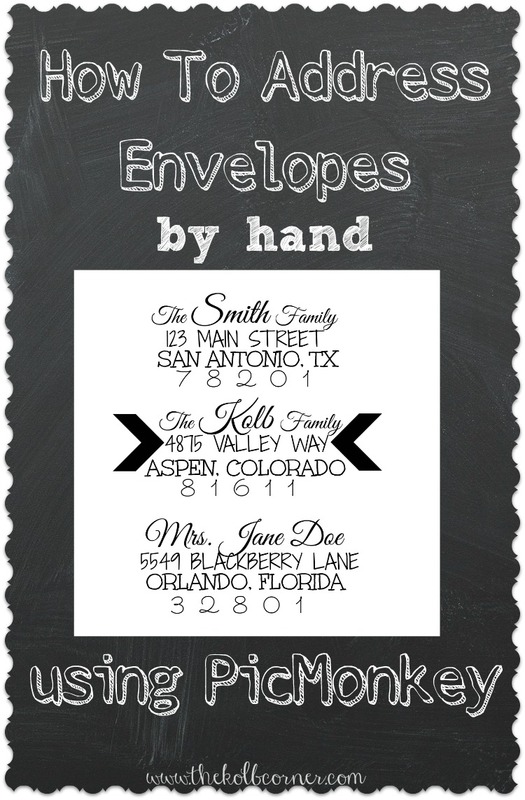 How do you suggest doing this for black envelopes? 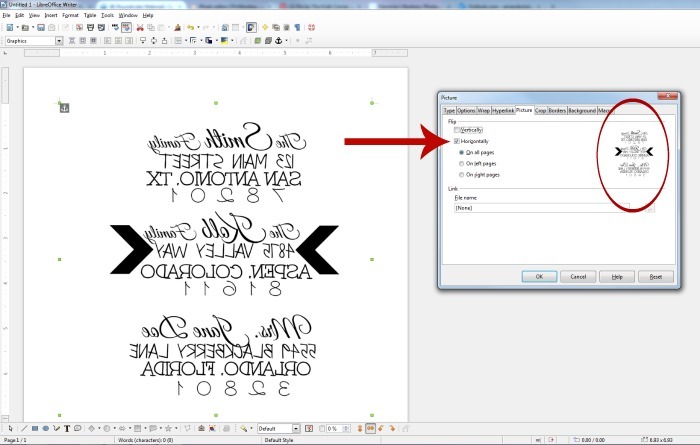 Ashley–You should still be able to see the transfer, but if you have trouble try printing the addresses out in BOLD print for more ink effect. For going over the transfers, you could try using a skinny tipped white (or other color) paint marker or Gel pens. I’ve found both of those at Hobby Lobby and Michael’s. Just be sure to let the ink dry completely before setting something on top of them, so the ink doesn’t smudge. Hope that helps! Thank you!! I’ll try printing it in bold now to see if that helps. Thank you so much for this!! I love all those fancy addressed envelopes, but I’m not very artistic(nor do I have the patience)! This is going to help so much! Thank you for stopping by Candy!! Hi Kritsy Lyn! The photo right above step number 4 shows which fonts were used to create the look–Great Vibes, Shadows into Light Two, Unkempt, and Sacramento. 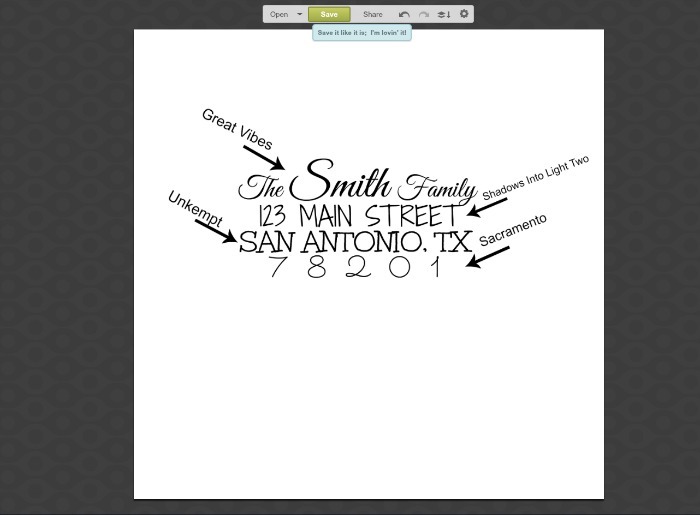 All of those fonts are part of the free version of PicMonkey. Thank you so much for dropping by and the sweet comment. I love handwritten…anything so much more than printed. If I write on an envelope and it doesn’t look the way I like, sometimes just 1 or 2 letters in, I will start over. I’ve went through 10 envelopes before trying to get “the one.” Same way on my white board. Crazy, I know. So, THANK YOU SO MUCH FOR THIS! You have given me many more hours of life. Lol. This is so cool! What paper did you use to print the addresses ?? Hi Mia! I just used regular copy paper for this project. It worked perfectly. This is going to be so helpful when I start addressing my wedding invitations! I have been dreading that task since I got the invitations. I love the look of handwritten envelopes and I didn’t know how I was going to address them to make them look good but I’m definitely going to do this now! Thank you! You’re welcome Laura! Have fun! Is there a certain type of printer ink you have to use? I’ve tried this several ways and it won’t transfer 🙁 This is such a great idea any help would be appreciated. Hi Caitlen! I’m sorry you are not having luck with this. I didn’t use any special type of ink, just regular black ink and an inkjet printer. I did transfer the fonts right after printing so the ink hadn’t completely cured. Also you have to use quite a bit of pressure with the pencil when you are transferring. I hope that helps! Thank you so much for your reply! Applying more pressure did the trick 🙂 thank you again for the great idea and your help!! I’m so glad it helped Caitlen! I stumbled upon your blog entry in a pinterest search about addressing my Christmas cards and let me just say that I wish I had seen this last year when I had over 30 cards I sent out, all of which I did freehand, and so elaborately that it took me several days. This would have saved me soooooooo much time and effort! The worst part is I did something incredibly similar to this but with wood and wax paper about 4 months before I did my Christmas cards and the thought never crossed my mind that I could use the same method. Thank you so much for making sure this was out there for absent minded people like myself whose brain is already running 23445493759847543 miles per second with everything else to think of easy short cuts like this to save time and effort. Thank you for your sweet words Lilly! There are so many things that go running through our minds especially around the holidays, so I’m glad I could help you out. Happy Holidays to you and yours!